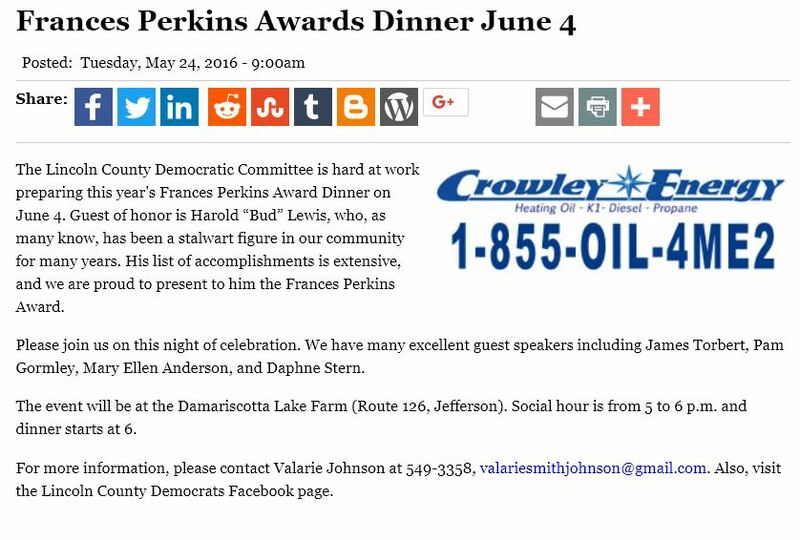 The Lincoln County Democratic Committee is hard at work preparing this year’s Frances Perkins Award Dinner on June 4. Guest of honor is Harold “Bud” Lewis, who, as many know, has been a stalwart figure in our community for many years. His list of accomplishments is extensive, and we are proud to present to him the Frances Perkins Award. Please join us on this night of celebration. We have many excellent guest speakers including James Torbert, Pam Gormley, Mary Ellen Anderson, and Daphne Stern. The event will be at the Damariscotta Lake Farm (Route 126, Jefferson). Social hour is from 5 to 6 p.m. and dinner starts at 6. For more information, please contact Valarie Johnson at 549-3358, valariesmithjohnson@gmail.com. Also, visit the Lincoln County Democrats Facebook page.